On July 27, Eiju Miyara and children from Miyara Elementary School repainted the monument at the “730 Intersection” in Ishigaki. 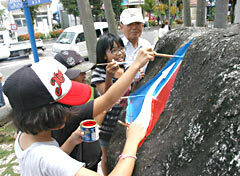 On July 27, Eiju Miyara from Miyara, Ishigaki and four pupils from Miyara Elementary School repainted the 730 (representing July 30) monument and cleaned the surrounding area to commemorate the anniversary of July 30, 1978, when the road rules switched from people driving on the right-hand side of the road to the left. At that time, Miyara was working in the Traffic Division of Yaeyama Police Station and was involved in traffic reform. Miyara designed the monument, which was built in September 1978, so it has a special meaning for him. Six or seven years ago, when Miyara saw tourists taking photographs in front of the monument he realized that it had became a sightseeing spot and thought of cleaning it up and repainting it. Since then, every year, as July 30 approaches, Miyara repaints and cleans up the monument with children from Miyara Elementary School.